Callum had an incident at school yesterday (Don't worry; he's fine! He did good!) which necessitated a trip to the office for me. I'm so glad I got to be there and chat with the director of the middle school. He's a wonderful man who gives off a bit of an absent-professor air. When you start talking to him though, you know immediately that he's tack-sharp and that he just gets kids. If I were a kid in his middle school, I'd so appreciate how unflappable and calm he is. As a parent, I know I do! After we discussed what we needed to discuss, our conversation turned, just briefly, to the events of last Friday. "I'm so glad they are here," he said. "They need to be here. In school. Taking exams, seeing their friends. Doing what they are supposed to be doing." He's right. The interwebs were pretty special yesterday, I thought. A really nice mix of reflection and light. Just what I needed. I hope it was what you needed too. And while I'm not completely ready to get back to normal (I find myself too desperate for change to be ready for that. ), I'm ready for some normalcy around here. And when you're around here, what's more normal than food? I can remember a conversation I had many, many years ago with one of my oldest friends. We were in college and she had told me about some fantastical meal a friend of hers had for dinner growing up (I wish I could remember what it was!). I remember being stunned at said meal, totally impressed until she pointed out, "I think it's just the kind of meal they regularly. You know, the way we have tuna noodle casserole (which Neel, by the way, calls "Tuna Pea Wiggle.") every week or so." Ah. I think of that conversation every so often in the course of making meals for our family. What will Callum call the meals that pop in and out of our weekly rotation? Will they move forward a generation? Will they make it, as some of mine and some of Neel's have, into his own family's lexicon? 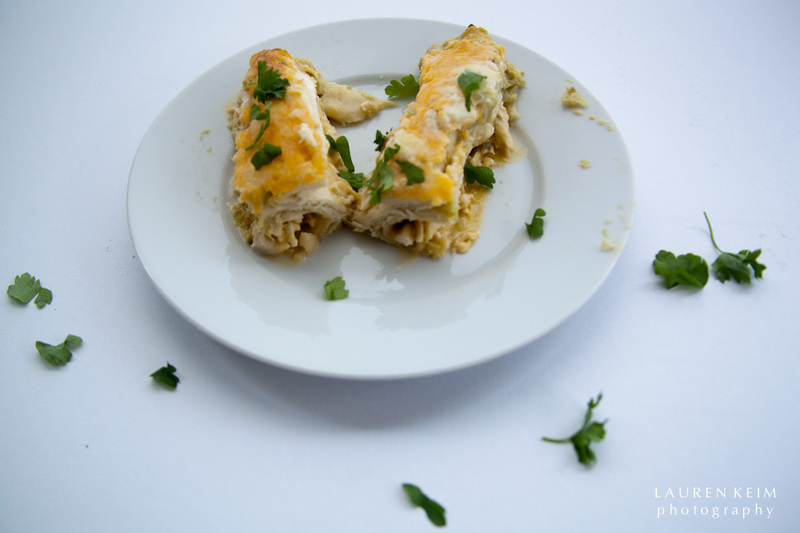 I hadn't made these chicken enchiladas in awhile, so I was particularly happy when our boy said, "Oh good! I like those." We do like them. Chicken is almost always my choice over beef, and the tomatillos make for a lighter sauce, one that's filled with spirit and tang. The recipe makes a gazillion enchiladas (like 8 big ones, maybe? ), so it's great for us to have leftovers for the week. My friend Catherine first gave us the recipe, but now I've made it so many times that I kind of go by feel. I'll try to suss it out for you here and make up some measurements. 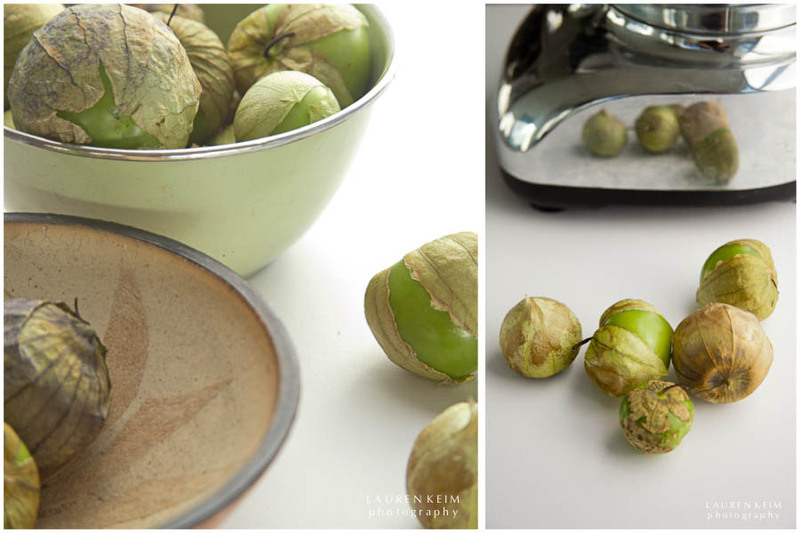 Husk the tomatillos and halve them. Broil for 7-9 minutes until soft and brown. Set aside and reduce heat in the oven to 375º. Saute´ half of onion in 1 tablespoon of oil until translucent. Transfer tomatillos and onion to a food processor or blender, add chilies, cilantro, cumin, sugar, and salt and blend until smooth. Return sauce to skillet and add broth and cream. Heat until thick. In a large bowl, combine chicken with half of onion, and half of each kind of cheese. Add 1/2 cup of sauce to chicken and combine. I warm tortillas by wrapping them in a towel and popping them in the microwave for a few seconds (maybe 45-50?). You may have another method, so go for it! Spread 1/4 of sauce on the bottom of a 9X13 casserole pan. Put roughly 1/4 of the chicken mix into the center of the tortilla, and roll it up, placing the rolled tortilla seamed side down in the casserole dish. Repeat with the remaining tortillas. Cover enchiladas with remaining sauce and cheese and bake until warm and bubbly, about 20-30 minutes. 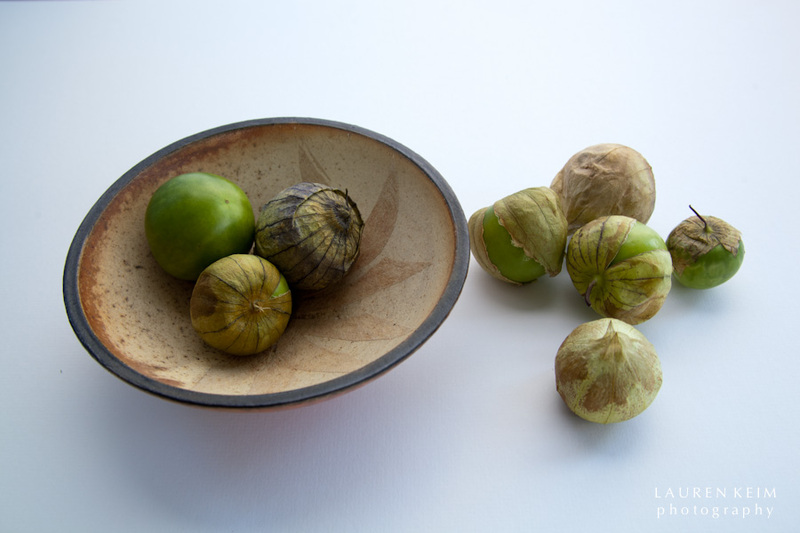 Annie made my figs from last week for Sam over the weekend, and that very fact filled me with delight! if you ever make one of my recipes, please! I want to know!